TechCrunch have published some Comscore data that compares Facebook and Twitter, among others, to the new kid on the social media block, Google+. 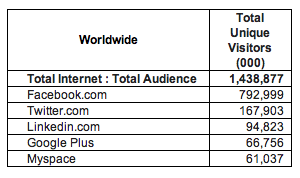 Google+ had a respectable 66 million unique visitors last month. While this may fall well short of the 150 million some forecasters were speculating, it’s still early days for Google’s site. Like many, I’ve invested so much content in Facebook, Twitter and my blog, that changing to Google+ seems irrelevant, even if it is possibly better, than the other options.